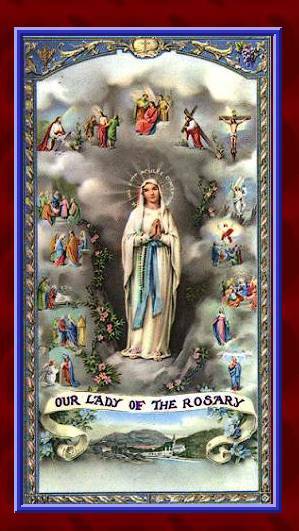 Last Sunday one of our people handed me a leaflet advertising a conference at The Catholic University in Washington, and calling for a week of fasting and prayer beginning with today’s feast of Our Lady of the Rosary. Indeed, there are quite a few things to pray for; quite a few devils of the modern world that will only be “cast out with much prayer and fasting,” as we heard in the Gospel during the recent Ember Days. There are wars and rumors of wars; invasions by infidels; political instability at home and abroad; attacks on the family, and myriad of attacks on human life itself; God’s holy Church is daily attacked both from within and without. It is interesting to reflect on the way the world has changed over the years, and yet to see that things remain much the same in spite of the change. The first few lessons of the Divine Office this morning were from the Old Testament Book of Ecclesiasticus. Much like the reading we just heard from the Book of Proverbs, they accommodated the testimony of God about His own Divine Wisdom to the Blessed Virgin Mary: “I am the mother of fair love and of fear and of knowledge and of holy hope ... before the earth was made ... I was already conceived.”  We are given to understand that even though Mary’s earthly existence began somewhere near Jerusalem only a few years before Christ, she had been eternally conceived in the mind of God—the incarnate Wisdom of God would one day give birth to the incarnate Word of God, our Lord Jesus Christ. God’s Word would “become flesh and dwell amongst us, giving us the power to become the adopted sons and daughters of God.” With the cooperation of Mary, the “new Eve,” the “new Adam” would restore the life of divine grace to the children of the old Adam and Eve—by dying on the tree of the Cross, He would restore what was lost in eating of the forbidden tree in paradise. And, as if her efforts on our behalf were not enough, Mary would continue to look after her adopted children throughout the centuries on earth. Jesus’ sacrifice on the Cross was sufficient for the redemption of one and all; it is not repeated like the sacrifices of the Old Testament; Holy Mass is not a new sacrifice offered each day, but rather a renewal of the one Sacrifice of the Cross. But, ever the protective mother, we have seen over the centuries that Mary has been willing to “spread her skirts” over her children in our times of greatest need. Some of our Lady’s intercessions are remembered in history. On October 1st in the year 911, her Christian people in Constantinople, totally outnumbered by the Moslem troops seeking to invade that city, spent the entire night in prayer to the Mother of God in her church of “Holy Wisdom—Agios Sophia.” The eyewitness accounts tell us that in the morning the Blessed Mother was seen extending her veil over the entire city, repeatedly frustrating the attacks of the Moslem invaders and ultimately making it possible for the Christian troops under Leo the Wise to win a decisive victory. We are privileged to have a picture of this miracle here in our church—what the Catholics and Orthodox of the Rus–­Ukraine call “Pokrov—the Holy Protection” of the Mother of God. Pope Benedict XII (r. 1334-1342) set aside the third Sunday in November in thanksgiving for all of the victories over infidels and heretics given through the intercession of the Blessed Virgin. Through the intercession of our Blessed Mother, Saint Dominic Guzman established an Order of Preachers to go about the areas in France where the heresy had taken hold. Our Lady’s plan was threefold. First, there must be penance, for Dominic’s priests and nuns would have no beneficial effect if they, themselves, seemed to be living the “high life” while professing poverty, chastity and obedience. Then, there had to be wisdom, the ability to appreciate divine things—this Dominic would provide through the services of his order of preachers and teachers. Finally, their had to be piety, for other things would be empty and meaningless if not directed toward God. Our Lady’s Rosary was precisely the instrument needed to furnish all three: penance and wisdom and piety. Perhaps most important of all, the Rosary was suited for the common people, so many of whom had been mislead by the heresy. Disciplining one’s self to pray the fifteen mysteries was something of a penance—but one that working men or women could fit right into the midst of their daily activities. There was piety too, and a sense of spiritual unity with the clergy who prayed the one hundred and fifty Psalms of David each week (often in the Presence of the Blessed Sacrament). The hundred and fifty “Hail Marys” of the Rosary were manageable by people who couldn’t read, and who had to spend most of their days working in their homes and in their fields—people who might not even be able to get to daily Mass. And think of the wisdom they gained in meditating on the mysteries of the Rosary. People who had been asked by the heretics to believe that human life was evil were now able to meditate on the lives of Jesus and Mary—they were guided to understand that God Himself, pure spirit, had not only made man and his world, but had elected to be born into that world, taking flesh from a human woman. No one who devoutly meditates on the life and death and resurrection of our Lord, and on the role played by His holy mother, can remain a heretic for very long. Today’s Office also tells us about the role of our Lady and her Rosary in winning the decisive naval battle of Lepanto on the first Sunday of October in 1571. Islam controlled virtually the entire Mediterranean Sea—raiding Christian vessels at will and even sending raiding parties ashore in Western Europe—it was starving and enslaving and even depriving Christians of their very Faith. Protestantism had taken hold in the countries of the north, so the Catholics of the south were on their own. Prospects looked bleak indeed until Pope Saint Pius V organized both a Catholic military alliance under Spanish leadership, and an alliance of people to pray the Rosary while the Catholic Marine forces battled in the Gulf of Lepanto, off the Greek Islands, on October 7th. The Office also recounts a land battle under similar circumstances, this time just outside Vienna in 1716, also under the patronage of our Lady and her holy Rosary. The feast today, originally celebrated under the title “Our Lady of Victory” or “Victories,” was ultimately extended to the entire Church, commemorating all of the victories of our Blessed Lady over tyranny, heresy, and infidelity under the more general title of Our Lady of the Rosary. No doubt, there are many other stories of our Lady coming to the help of Christians—too many to recounted today. Sometimes our Lady protects the Church; sometimes a nation or an army; sometimes a family or a person all alone; perhaps a child. For the most part the accounts follow a single pattern: through the Rosary, or occasionally, through some other devotion to the Mother of God, His people are led to penance, piety, and holy wisdom. And having thus been led to God, and under heavenly protection, they are able to deal with the difficulties of living a Christian life in this world. Note that there is no magic—the enemies of the persecuted don’t just vanish; food doesn’t just appear in the refrigerators of the hungry—but God does give His faithful ones the means to do what must be done, and the inclination to help each other to do it. After Mass this morning we will bless Rosaries and they will be available for anyone to take with them. I ask only one thing in return for Rosary you take: don’t go home and put it in a drawer somewhere, nor on a knick-knack shelf, nor confine it to oblivion in the glove compartment of your car. Keep it in your pocket or somewhere convenient so that you can use it to pray every day. Pray at least one decade every day—you will find time for more, but don’t ever go without praying at least one. Our modern world; the Church, the state, our communities, and our families are all in need of the penance and piety and wisdom that our Blessed Lady bestows in abundance on those who are faithful to her. Mary does help those who have recourse to her to help themselves. Gospel, Ember Wednesday in Fall: Mark ix: 16-28. First Nocturn, Ecclesiasticus xxiv: 11-31. Epistle: Proverbs viii: 22-24; 32-35.